Is there anything better than a good fat dress? I use that term lovingly as I have had my share of skinny dresses and fat dresses over the years and I can tell you that there is really nothing better in the world than a good fat dress. I get all mine at Savers – the best thrift shop evah. 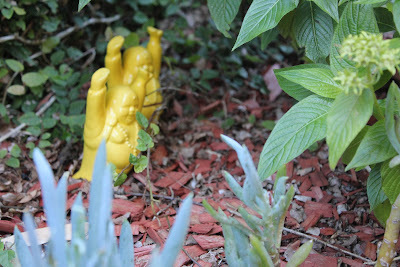 They are just soooo perfect for gardening in the summer or for putzing around the house. No need for underwear or slips or bras or any of those torture devices. I have to admit that I am this close to moving from the less-than-horrible, comfy fat dresses one rack over into the actual house dresses. I have avoided these for some time because that’s a slippery slope, me dears. Once you get a mauve, button-up dress with embroidered bees on it, you’re done for. Now, don’t get upset with me if you’re already there cuz I’m telling you that I’m almost there. It’s that damn flounce at the bottom that really keeps me away. But if there was a thin cotton one in blue tick pinstripe with no flounce… oh, I’d be done for. Don’t you just love a good fat dress? Am I the only person who actually gains weight in the summer? I just cannot get much exercising done unless it’s before 8 in the morning and, um, that doesn’t happen much around here. I also drink a lot of cold beer (and mojitos) and eat a lot of summery pasta dishes because, well, it’s summer, FFS! So, three cheers for the fat dress!! PS I wonder what the equivalent of a fat dress is for the boys? WHAT IS WABI-SABI, YOU ASK? Hard to explain, really. Wabi-Sabi is a Japanese term, obviously. It’s been semi-mainstreamed by the American gardening and decorating industry. In a nutshell it means – an appreciation for that which is not perfect. Finding beauty in something old and rusty is wabi-sabi. Picking something up off the side of the road and using it in a new way is wabi-sabi. Making do with what you have is wabi-sabi. It’s a lovely concept that describes me and my house and my yard perfectly: appreciated, loved and perfect in our own imperfect way. And how about this awesome gate that her skillful husband, Jackdaddy, built. Click HERE to read the post she wrote about this project. So needless to say, I love just about everything MamaHolt has to say or do or dream about. Check out her blog–you will feel like you’ve found a friend! And BTW, MamaHolt, you may be smart, and creative, and funny, but you are NOT FAT!! She's one of my favorites too! Love her blog and her carefree musings. OH mah GAWD!! I'm thrilled! You made me sound so much better than I really am, you know. I better get over to my blog and write something funny. hahaha. WOW! I'm just so excited I don't know what to say. THANK YOU from the mutual admiration society. I love your blog as much as you love mine…ahhhhh. PS No, I am not fat, but I'm 48 and you know how things move around at that age. wink wink. LOVE these blogs – thanks for the recommendations! I was telling my daughter just the other day that I am SO done with low waisted jeans and if high-waisted ones don't come back soon I'm moving on over to the house dress (or as my grandma called them 'house coats'). Hey there! Know you're taking a break but I was looking through some comments and saw yours about taking a photography class/seminar…how did it go?